The American River College women’s basketball team defeated Cosumnes River College 66-52 on Jan. 18, despite struggling with team fouls. The Beavers led Cosumnes River in team steals (15-10), blocks (4-1), and assists (21-9). This win brought ARC to a 2-5 league record and an overall record of 9-9. The high intensity started off with ARC going straight into their full court, man-to-man press against the Hawks. “They only had six players, so we were trying to make them as tired as possible,” said sophomore guard Alana Myers. ARC earned 15 team steals against CRC, according to the American River College athletics website. “I think we did good on the defensive side. We did very good defensively, so if it carries on to next week we’ll get a couple more wins,” said Deja Samuels, guard, the Big 8 Player of the Week. The first quarter resulted in the two teams at the free throw line due to multiple fouls committed by each team. The Beavers shot 61.9 percent from the line as they made 13 out of 21. “When we play at home, we do a lot worse at the free throw line than we do away,” Samuels said. ARC shoots an overall 60.1 percent from free throws on the season. CRC had a total of 19 team fouls and the Beavers had a total of 20. Brookelyn Larkin of Cosumnes River fouled out ending with 28 points, 3 assists and 5 rebounds. Myers and Samuels from American River also received 5 fouls. Myers ended with 2 points, 3 assists and 4 rebounds and Samuels had 12 points, 7 assists and 8 rebounds. “We both should have known that we had our fourth foul and we should have just backed off a little bit,” Samuels said. Meyers agreed with the assessment. “Things happen. We can’t control that,” she said. There will always be a few aspects the team can work to improve on for future games, even after a win, according to Meyers. “Our strength is starting to become defense, and also our passing is way better. Our weakness is probably fouling,” Myers said. 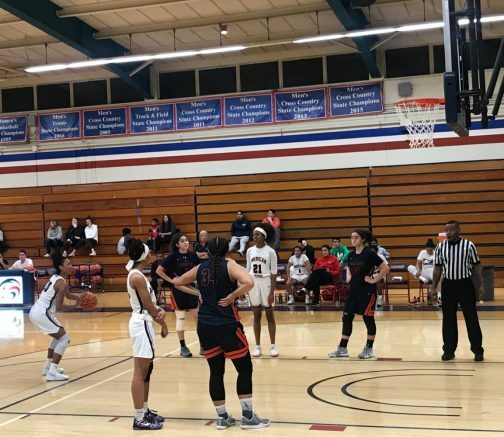 ARC’s next home game will be against Diablo Valley on Feb. 5 at 5:30 p.m.
Be the first to comment on "ARC wins second league game against CRC, 66-52"